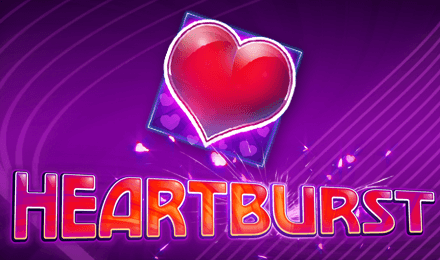 Play Heartburst | Best Online Slots @ Vegas Spins! Get ready for an explosion of colours with Heartburst Slot by Eyecon! You can enjoy this 5-reel, 100-payline slot at your favourite online casino, Vegas Spins. Join the fun on this retro classic game which reminds of traditional slot machines. It is set against a purple backdrop, with reels containing colourful symbols such as the Lucky 7, Grapes, Orange, Cherry, Watermelon, Bell, Lemon, A, K and Q. Enjoy this exceptional slot at Vegas Spins using several types of devices! Start by adjusting your bet on Heartburst Slot. To pick your preferred amount, toggle the Coins tab. Once you are ready, press the Spin button to launch the game. You can also use the Auto Play feature to set several games that are played successively. At any point during your gameplay, you can cancel this feature. Bet Levels: The game does not consist of bet levels. Amount of Paylines Selection: Up to 100 paylines are available for your gameplay. Coin Values: The coin sizes vary from 0.01 to 0.50 units. The Wild icon on Heartburst Slot is the Heart which substitutes for any symbol to form a winning combo, except for Scatter. It lands only on reels 1, 3 and 5. When a 3x multiplier is applied to the Wild symbol, the latter expands to cover an entire reel, which turns out to be very lucrative. The Lucky 7 stands for Scatter on Heartburst Slot and activates the Heartburst Free Spins Feature. When 3, 4 or 5 Lucky 7s appear, you can earn 15, 20 or 25 Heartburst Free Spins, respectively. This feature can be retriggered up to 15 times when more Scatter symbols show up on the reels. On Heartburst Slot, you can also enjoy a Gamble round. It gives you the possibility to gamble your last win and is activated after any winning spin. From the 2 choices displayed, choose the correct one to double your win. If not, everything is lost and the round is over. Up to 5 correct selections can be made and you can trigger up to £32,000.00. Admire bright colours during your gameplay on Heartburst Slot at Vegas Spins. Good luck to you!